Heather and Clay had their ceremony and reception at the Youngstown Yacht Club. They wanted their photos and first look done before the ceremony. The ceremony was going directly into cocktail and reception, so this was the time for photos! They both got ready right down the road from Fort Niagara State Park. The venue was also right down the road. They wanted to go into the old historic Fort for photos. We love it there! There is so much history and so many amazing locations to use for photos. You would never know this image of the bride was taken there though. There are not buildings or cannons or men in military uniform. But, this is on top of one of the bunkers on the grounds. There is a little walkway on top. 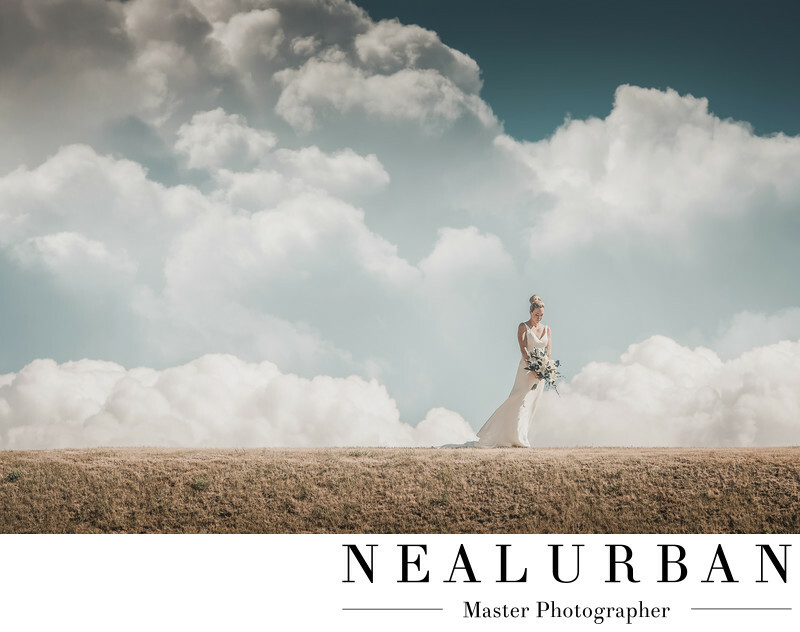 Neal noticed how beautiful the clouds were looking and had the bride and groom both go up. He did portraits with the husband and wife to be to start. Then Heather's dress started to flow in the wind. It was time for a solo bridal portrait. The angle Neal chose to shoot at was pretty interesting too. He shot below the bunker to make the sky and clouds more prominent in the image. The clouds were white, puffy, and dreamy. He took the photo on a slight angle as well to make it look like Heather was walking up hill. He captured just enough of the ground to create that effect. The bride took a few steps and the wind picked up the train of her dress! You can see the dress is stuck to one of her legs. Neal wanted her to be in motion. Then she looked down to her flowers! We love the wind here at Neal Urban Studio. The more creative we can be, the more amazing the photos. Brides and bridesmaids don't always agree because their hair may get messed up a bit. We tell them to trust us! It's worth it. Couples who truly know and love our work get excited when we can do things like this. Brides who did not want a veil, see our photos and purchase cathedral length veil just for pictures! Heather did not have a veil, but did not need one. Her dress had the same dramatic effect!